In an age where consumers are increasingly embracing the “buy local” movement, community-focused Pet Supplies Plus has long been America’s favorite local specialty store for people passionate about their pets. The thriving national brand, with a neighborhood feel, is also the perfect franchise fit. Mike and Rachel Zavasky are a dynamic father-daughter franchise duo who own two Pet Supplies Plus locations in Pennsylvania and recently opened a third store in Florida. When the pair decided to team up in business, they did their due diligence, researching all types of brands –from yogurt shops to bagels to bird supplies – before deciding on Pet Supplies Plus. A visit to the corporate office of the Livonia, Michigan-based franchise sealed the deal for the successful multi-unit franchisees. With overall spending in the pet industry projected to soar to an all-time high of $96 billion by 2020*, Pet Supplies Plus leads the way in the industry as a top franchise poised for growth. The franchise, founded in 1988, operates more than 450 stores in 33 states. The brand is known for its personalized approach, offering a variety of natural foods, hard goods, and pet services in a welcoming way. The Zavaskys epitomize the brand’s focus on community service through partnerships and events with local animal shelters, nonprofits, and rescue organizations. The franchise owners even helped put on a benefit concert with the Humane Society featuring the rock band Gin Blossoms. Pet Supplies Plus stores are also known for fun, pet-bonding events designed to socially connect pet parents in the community. Other neighbor-centric features include self-pet wash stations, new pet parent education, and carry-out service in which team members carry heavy items to neighbors’ cars – for every neighbor, every time, at every store. This type of hands-on time in the stores and within the community is the favorite part of the business for Rachel Zavasky, who serves as Director of Operations for the stores, and also assists her father with payroll, invoicing, and event planning. There’s a lot to love about the brand. Pet Supplies Plus is among the top 50 in Entrepreneur Magazine’s Franchise 500 Ranking and the #1 pet industry brand for the last 5 years. Franchise owners cite the low fees and labor costs as key benefits. According to the brand’s current Franchise Disclosure Document (FDD), stores have averages sales of over $2.2 million**. For franchisees, Pet Supplies Plus is a solid investment backed by over 30 years of leadership and support. “They have proven expertise and are always available to help improve business,” notes Mike, who also cited his District Team Leader, a special regional mentor provided to every Pet Supplies Plus Franchise Owner, as a key asset to the onboarding process. “We welcome all their suggestions and have had success in implementing them,” he adds. Pet Supplies Plus is seeking to expand its winning franchise model with business savvy pet lovers with growth markets available across the country, with special emphasis west of the Mississippi River. 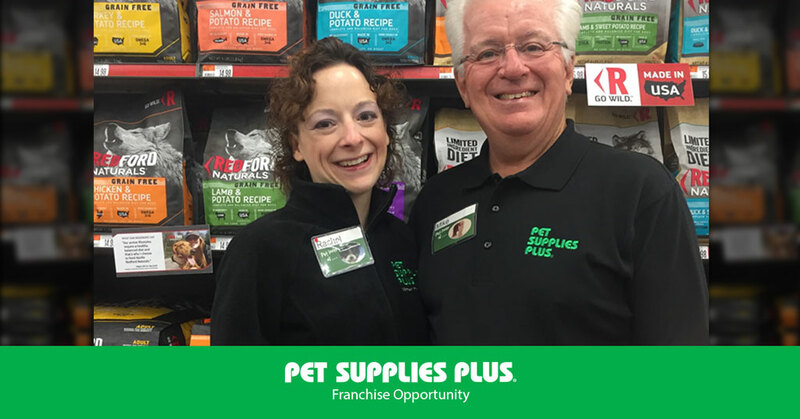 To learn more about the Pet Supplies Plus franchise opportunity, visit https://www.petsuppliesplus.com/franchise/. **According to Pet Supplies Plus 2018 FDD.